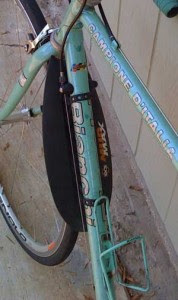 For years, fenders were not considered "cool" on bikes used by "serious" cyclists. However, with the increasing popularity of bike commuting in the past couple of years, fenders have redeemed themselves and become a must-have item on bikes used for practical transportation. A good pair of fenders helps to keeps the muck off of your bike, and yourself, when the weather turns sour and you've still got to ride no matter what. Many people use a rear cargo rack on their bike, which can provide some of the benefits of a fender, keeping some of the road splash-up from reaching your backside. However, you'll still get some splash from the rear surface of the tire that will make its way up and around the cargo rack. Plus, as the tire rolls forward, it will throw water, dirt, and mud onto the middle section of your bike frame, crankset, pedals, and front derailleur, not to mention your pant legs and shoes. What do you need to know when selecting fenders? What makes one fender better than another? Let's start by describing the most basic fenders, and work our way up the fender food chain from there. 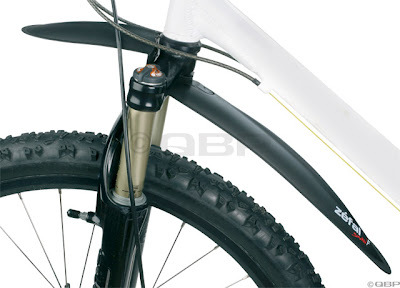 The most basic front fender is called a down tube fender, and it just straps onto the down tube of your bike frame. These fenders are fairly inexpensive (under $10), and work on just about any bike, and some people even make their own versions using a piece of an old pop bottle and a pair of zip ties. This type of fender keeps some of the spray from the front wheel off of you and your bike, but if you steer to the left or right any significant amount, the spray can go around the fender. Another simple kind of front fender bolts or clamps to the underside of the front fork crown. Depending on the type and size of the clamp, they attach easily to most road bikes and mountain bikes with rigid or suspension forks. 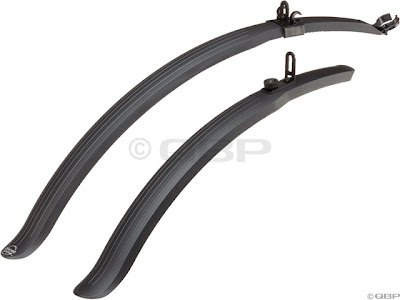 They provide a little more protection compared to a down tube fender, and they work with your steering. These typically sell for $15-$20. 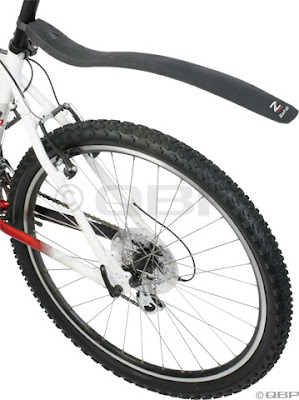 A similar and simple type of rear fender can be clamped to your seatpost. These give a little more protection than the rear cargo rack, but don't solve the problem of the splash coming from the rear wheel onto the area around your feet. These fenders go for about $15-$20 each. Bettter fenders come in a matching front and rear set. A basic clip-on fender set can be bought for under $20. 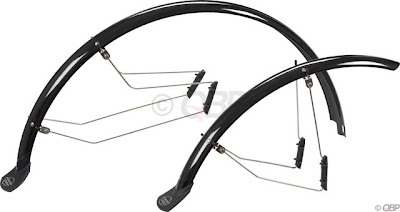 These provide better protection than the front and rear fender styles shown above, but they tend to wobble a lot while you are riding, which can even make them rub against your tires. The best option for durability and protection from the elements is a pair of full-coverage fenders. On a standard full-coverage fender set, the front fender will bolt to the fork crown, and also to the bottom of the fork eyelets using a pair of long metal struts. The rear fender will bolt to the frame in three places: the chainstay bridge (the part of your frame just in front of the rear wheel), the seatstay bridge, and the eyelets on the frame near the rear hub. A decent set of full-coverage fenders will run you about $40 or more. A rear full-coverage fender completely encloses the upper half of the wheel, giving you the maximum protection from splashes coming from both directions on the rear wheel. The front full-coverage fender comes halfway down the back side of the front wheel, and extends a few inches in front of the fork. Some will have mud flaps on the ends for additional protection. On the even better models, the mud flaps are held in place with two bolts or rivets each (instead of one), preventing the mud flap from shifting out of position. Most full-coverage fenders are made of plastic (usually black; sometimes silver) with steel mounting hardware. The better ones have stainless steel hardware. Some higher-end models are made with plastic-coated aluminum. You can even order custom-made all-aluminum, all-stainless, and even wooden fenders, in a wide array of colors, if money is no object. 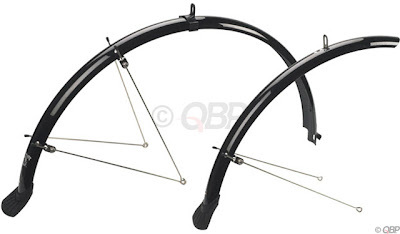 To use a standard full-coverage fender set, your bike must have the necessary mounting eyelets on the frame and fork that were mentioned above. Or, if you're willing to do some experimenting and jury-rigging, you can use a set of rubber-coated metal clamps that can be found in any hardware store. In either case, there unfortunately is no such thing as a "universal fit." Any fender installation is a time-consuming trial-and-error process, and there's no guarantee that any particular fenders will work on a specific bike until you just try it. When selecting a full-coverage fender set, you'll need to select the proper size fenders based on the diameter and width of your tires. Most fender sets come in a 26-inch size (with about 60mm width) for most mountain bikes, and 700C/27-inch size for road, hybrid, and touring bikes. The road bike variety may come in a narrower width (about 35mm) for racing tires, and wider for hybrid and touring tires (about 42mm). Some manufacturers have also designed a 29er mountain bike specific version, which are about 65mm wide. A couple of companies make clip-on semi-full-coverage fender sets that work well on road bikes that do not have eyelets. The nice thing about these is that they install on and off quickly, so that you can leave them off of your nice lightweight road racing bike, but put them on for training rides when a spell of bad weather is expected. For unique bicycle designs, such as Electra Townie cruisers, Giant Suede cruisers, and recumbent bikes, you may need to find fender sets that are specifically made by the manufacturer for the model of bicycle. Whatever your bad-weather protection needs are, stop into your nearest Century Cycles store and let our experts help you make the best choice for your bike and riding conditions.